December 1, 2012 – March 5, 2013 at SFMOMA. South Africa In and After Apartheid brings together the work of three photographers: Ernest Cole, Billy Monk, and David Goldblatt. While each series is defined by specific concerns, taken as a whole they present overlapping views of South Africans reckoning with apartheid and its aftermath. 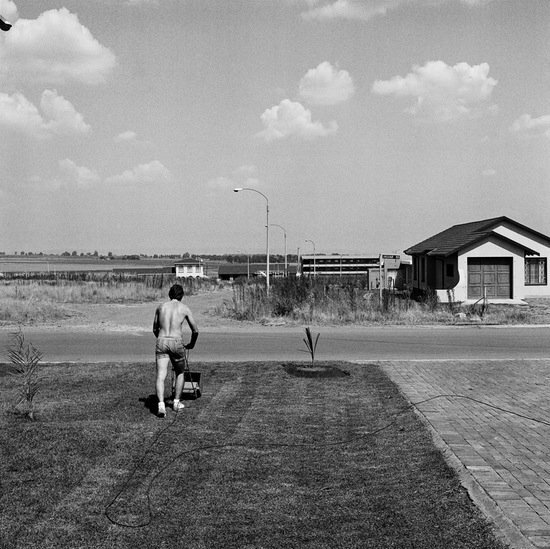 The exhibition opens with selections from In Boksburg, a series by David Goldblatt. Boksburg was a middle class suburb of Johannesburg during the Apartheid era. As the oversize map and reproductions of civil code that introduce the exhibition indicate, Boksburg represented the “successful” and altogether brutal separation of racial groups. David Goldblatt, Saturday afternoon in Sunward Park, 1979. Courtesy of SFMOMA Collection. Goldblatt’s series has a storied history: first, the images and accompanying text, written by Alan Paton, were rejected by Optima magazine in 1979 for their anti-apartheid position. Next, the series was published as a book, a venture that bankrupted the fledgling Gallery Press in 1982. With this rich backstory riddled with controversy, one might expect to see images possessed of the power to shock as censored material often does. Instead, Goldblatt captures an airless world that is easily dated to the dark days of 1980s fashion. It is almost at though one could smell the polyester, hairspray, and cleaning products that distinguished the well-ordered world his subjects inhabit. David Goldblatt, Dancing-master, Ted van Rensburg, watches two of his ballroom pupils, swinging to a recording of Victor Sylvester and his Orchestra, in the MOTHS’ Hall at the old Court House., 1980. Courtesy of the artist and Goodman Gallery. As a white South African, Goldblatt could travel easily and without restriction. His unfettered access gave rise to an almost anthropological study of his fellow countrymen and women. 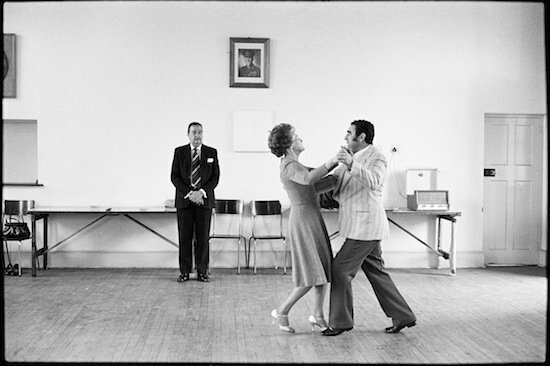 Before Goldblatt’s lens, we see people who are clearly at ease with both their social station and the rigidly enforced racial segregation that made Boksburg an ideal locale to document the bucolic lifestyles of those benefitting from apartheid: a couple in the midst of a dancing lesson, senior members of a women’s club in conversation, a young girl in a tutu. For the modern viewer, the familiarity these images evoke is comforting…but something is missing. Throughout the middle galleries of the exhibit, Ernest Cole’s works visualize the unnerving absence that haunts In Boksburg. Cole was the first black freelance journalist to work in South Africa, submitting work to publications including Drum magazine and Rand Daily Mail. 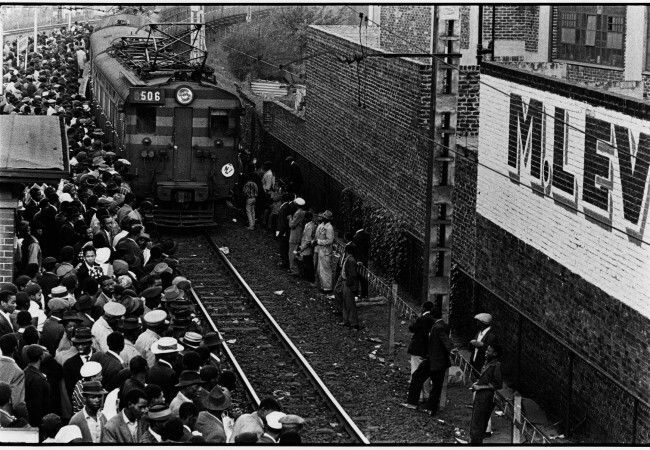 For the Bantu World newspaper, Cole reported on the daily challenges faced by blacks who worked in Boksburg. He lived in the congested townships that demarcated the outer edges of the city, a sharp contrast to Goldblatt’s shots of Boksburg privilege. Cole shows us the train that transported blacks to and from work every day. The trains ran so infrequently that riders often clung to the outside of the moving locomotives regardless of inherent risk. 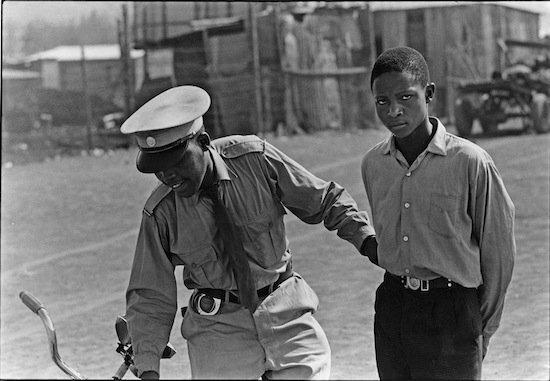 In another image, we see a young man being detained by a black officer — all adults were required to carry identification papers and submit to interrogation at any time. The young man’s arrest transmits both the humiliation of being searched and the moral quandary faced by blacks that reinforced the machinations of state control. Cole’s choice to photograph his community was indeed a dangerous one. He knew all too well that documenting injustice, and possibly inciting others to fight for their human rights, resulted in: harassment, beatings, and death. His own risk probably instantiated a unique sensitivity to documenting his fellow blacks, hence the power of his camera. Ernest Cole, A student who said he was going to fetch his textbook is pulled in. To prove he was still in school he showed his fountain pen and ink-stained fingers. But that was not enough; in long pants he looked older than sixteen., 1960–1966. Courtesy of The Ernest Cole Family Trust. Billy Monk’s work follows that of Goldblatt and Cole by revealing the unjust conditions of South African society. 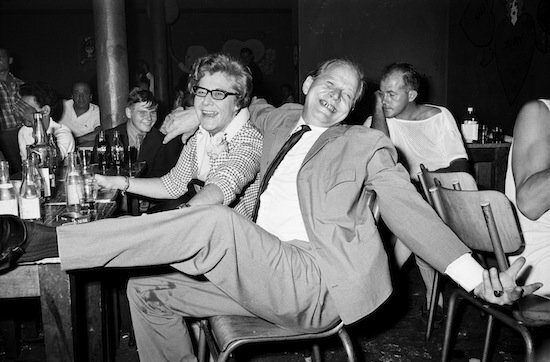 Monk made a living as a bouncer at The Catacombs, a notorious 1960s dive bar in Cape Town. He photographed the denizens of this demi monde to keep his boredom at bay. Monk identified all his images by the day, month, and year they were taken. He captured revelry at its most raw and ribald: a young woman slumped over after a long night of drinking, a middle-aged couple seeming not to care who witnesses their clowning. Without names to attribute to Monk’s subjects, the photographs become studies of what people do once the sun goes down and the oppressive pressures of state-mandated control are loosened. As Cole’s photographs are pendants to Goldblatt, so too are Monk’s: Monk’s images glorify the behavior — excessive drinking, disorderly conduct, inter-racial sexual liaisons — that so offended “polite” citizenry in South Africa and also inspired further draconian measures to limit personal behavior. The exhibition draws to a meditative end with a return to David Goldblatt, whose works posit questions about life at the end of and after apartheid. First, in the series entitled Ex-Offenders, Goldblatt worked with individuals either accused or found guilty of crimes ranging from petty theft to murder. The nine portraits, taken at the crime scenes and illuminated by lengthy explanatory labels, portray sobering stories that originate in a time of extraordinary sociopolitical change in South Africa. For every photograph of Nelson Mandela waving to adoring crowds, or shaking hands with former Prime Minister F.W. de Klerk, for every story of hard-fought success there are tales of despair that number in the millions. David Goldblatt illuminates this sad fact. 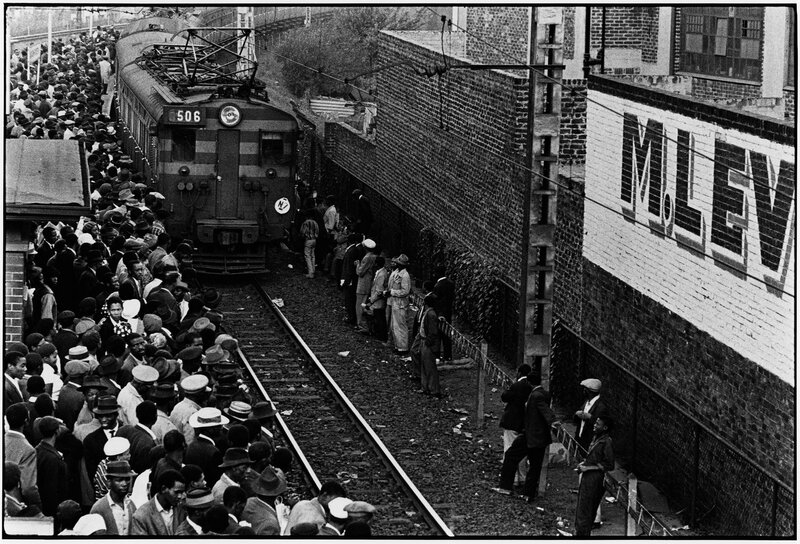 Billy Monk The Catacombs, 5 February 1968, 1968 (printed 2011) Courtesy of Stevenson, Cape Town and Johannesburg. These are hardscrabble people, and they rank among those who carve out an existence in the bustling cities and remote outpost towns that populate the landscape series that close the exhibition. In these places that are dominated by sand and sun, it seems that life during and after apartheid bear at least passing resemblance to one another — and that there is still urgent work to be done. Who, after all, are the people that populate the photographs of David Goldblatt, Ernest Cole, and Billy Monk? They are black and white South Africans who lived through a terrifying moment in social and human rights history. They are the inheritors of colonization and racial segregation, sloppy and deeply flawed. Finally, they are human, and it is the vast spectrum of behavior held up for consideration that makes this exhibition a success. As SFMOMA prepares to close its doors for three years for expansion, South Africa In and After Apartheidis evidence that the Department of Photography remains a leading force in humanist photography exhibition. Roula Seikaly is an arts journalist, writer, and curator based in San Francisco. She reports on contemporary art for KQED.